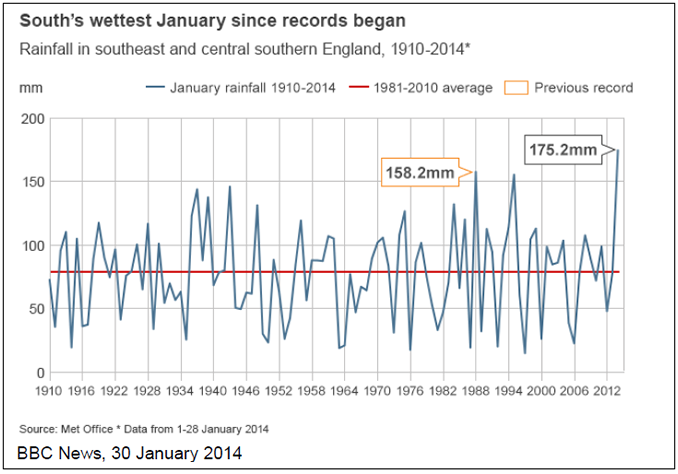 England is on course for the wettest winter since 1766. A succession of fierce storms, combined with high tides swept over the southern part of the country during December 2013 and January 2014. Rivers are now spilling out onto surrounding land underground water reservoirs are overflowing and the water table is up above ground level in many areas. With rain continuing to add to this situation the flooded land is getting no relief. The Environment Agency expects flooding to last until spring. That is very bad news for trees engulfed by floods. Most woody plants are poorly adapted for growth and survival in flooded soils although some can adapt to grow in waterlogged soils. Floods of short duration in the dormant season can be tolerated by most trees but flooding in the growing season is more disruptive to growth so the risk to our inundated trees increases as the floods persist. The Independent reported the latest situation as the soggy saga continues. While the UK was subjected to significant stormy weather – including heavy rainfall – today, Paul Leinster, chief executive of the Environment Agency, said: “Our hearts and sincere sympathy go out to those who have already experienced flooding. “We continue to have teams out on the ground 24/7 working to protect lives, homes, businesses, communities and farmland. “With further rain expected in the coming days, after the wettest January on record in England, the situation is likely to get worse before it gets better. “Further flooding is expected along the Thames, which could reach its highest levels in some places since 1947. River levels are very high across south west, central and southern England and further rain has the potential to cause significant flooding,” he warned. The Environment Agency and the Prime Minister have said Britain is on track to experience the wettest winter for 250 years. The pattern of rainfall over the last 100 years in southeast and central southern England shows that the overall amount falls back to below average after one or two years but how might trees be affected by this situation? How do floods affect trees? In conditions such as we have seen in the UK this winter the first effect of waterlogging on trees is that some have keeled over and been blown over in the stormy weather. As soils become inundated the natural flexing of trees is affected. Whereas in normal conditions trees sway from shoot tips to the base of the stem under flood conditions the flexing is restricted and this can make trees vulnerable to toppling in relatively mild winds. Also in moving water trees can be damaged by collisions with debris floating past. As floods subside and spring approaches trees will need to respond to the new growing season. Flooding of soil in winter, when roots are dormant is not as serious as it is during summer, when the trees are actively growing. At all times of the year, however, roots need to respire to stay alive. This means they need oxygen and a by product of this process is carbon dioxide. Oxygen deficiency is the most important environmental factor affecting growth in flooded trees. Diffusion of oxygen from air to root and carbon dioxide from root to air is slowed down by a factor of 10000 times when passing through water so flooding immediately affects oxygen availability to roots. Flowing water is less harmful than stagnant water to plant growth as the turbulence of moving water increases the availability of oxygen to roots, which is much faster than diffusion through it. However, even flowing water doesn’t deliver sufficient oxygen for normal growth. Root growth will be stopped by flooding but will commence as the soil drains. The root growth potential is greatest in the autumn and spring so, soil that is drying slowly in spring will inhibit root growth which will affect shoot growth. Growth of existing roots and the formation of new ones is greatly reduced in poorly aerated soil. 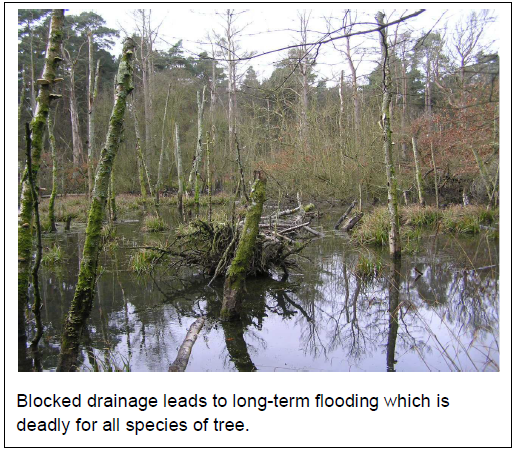 Flooding may increase or decrease diameter growth of tree stems; tolerant species may be stimulated by temporary flooding but usually an early acceleration of growth of trees flooded over a long period will be followed by decreased diameter growth and subsequent death. Often the thickening trunk is the result of bark growth rather than wood growth. Wood in flooded trees has been found to be anatomically changed with an increase in the presence of packing cells (parenchyma) and ray cells. Low vigour stimulates fungal growth. Fungal zoospores are attracted to exudates from stressed roots such as sugar, amino acids and ethanol. Phytophthora is a damaging and widespread collection of fungal diseases that spread in water and can tolerate low oxygen levels. Are all trees affected the same? Adult trees tolerate flooding better than over-mature trees or seedlings of the same species. Flooded plants are injured more by stagnant water than by moving water (excluding damage caused by debris). Even flood tolerant species can be damaged by standing water. 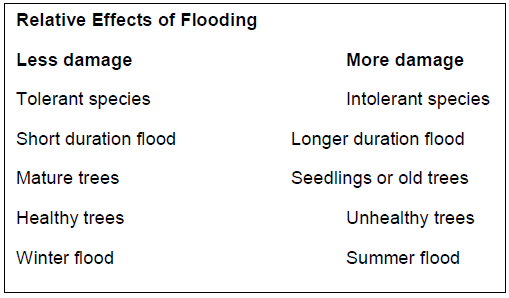 Flooding in the growing season is much more harmful than flooding in the dormant season. Some species of tree are known to tolerate flooding better than other. 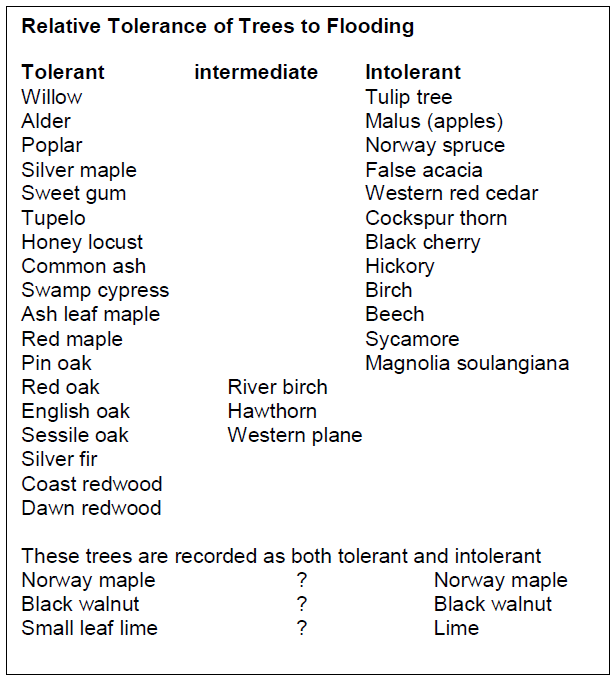 Below is a table compiled from some expert tree scientists in UK and USA. Notice that there is not universal agreement about the flood tolerance of all trees. Soil is an ever changing material made up of two things; soil particles and pore spaces between them. Soil is a storehouse for mineral nutrients, a habitat for micro-organisms and a reservoir of water for tree growth. It also provides anchorage for trees. The soil pore spaces are occupied by either air or water. Pore space in a well balanced soil amounts to 30% to 50% of the soil volume. Water in the soil is either held as a thin film coating the soil particles (hygroscopic water) or in a thicker layer around the particles (capillary water) or it is filling the rest of the pore spaces as free water which is drawn down through the soil by gravity. In flooded conditions all the air and gas in the pores is replaced with water in a very short time (a few hours) so gaseous exchange between roots and soil and air is seriously affected. Soil structure is altered by the breaking down of the clumps of soil (aggregates) and destruction of the chemicals that cement the soil particles and clumps together. The soil organisms that normally live in soil need oxygen so flooding kills and destroys them. Some micro-organisms, though, thrive in anaerobic conditions. These are mostly bacteria which produce hydrogen sulphide and nitrites that are harmful to tree roots. Tree roots produce carbon dioxide as a normal by product of respiration and, if this can’t get released into the air it builds up around the roots and is toxic in high concentrations. Trees that have a compromised stability due to root death or soil erosion or degradation may lean over increasingly. There may be cracks appearing in the soil around the base of the tree. These trees should be checked out by a tree expert and made safe. Trees undermined by overflowing rivers may not be reachable but as the water recedes they should be checked as soon as possible. Trees still flooded in spring may well struggle to break into leaf. Even recently flooded trees in soil that is drying out are likely to have a delayed bud break. Fungi infected trees are likely to struggle to contain the disease. This is particularly a problem where honey fungus is present as this can cause death and instability of quite a short timescale. There is likely to be an increase in the occurrence of trees infected with Phytophthora as this spreads through water and soil. Trees are likely to have an increased vulnerability to high winds due to damaged root systems. Damaged soils may become more compacted due to breakdown of aggregates and soil structure leading to restricted plant growth. Expect flood tolerant species to be affected less than intolerant species. Root growth is usually reduced more than shoot growth so drought tolerance will be reduced until the root system has recovered to meet the transpiration requirements. How can we identify flood damage in trees? 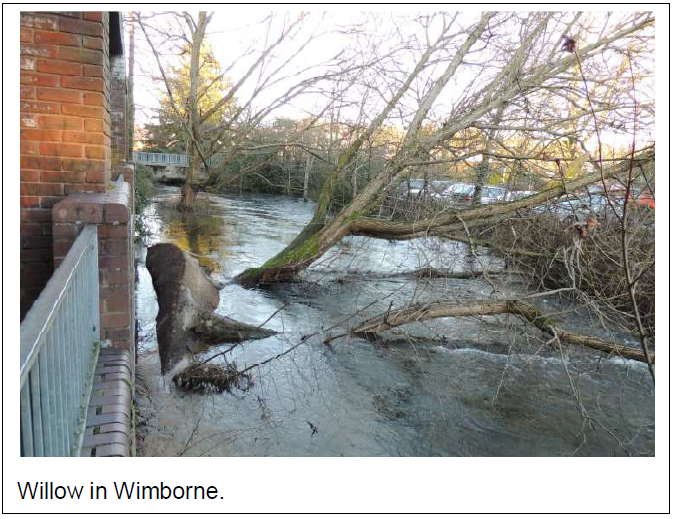 Many flood effects may look like symptoms of other problems but, knowing the history of a site and recognising all the symptoms may help to make a diagnosis. Effects of flooding can be expressed for up to a couple of years after the event. Flood damaged trees will come into leaf later than usual, growth of shoots and leaves will be less than normal and leaves may be chlorotic. Affected roots will be discoloured and possibly water soaked. Adventitious roots may form at the root crown. Stemwood may also be discoloured and bark may split. Stems may bleed or have cankers. Leaves may have oedemas (corky lumps) and branches may die. The soil around the trees may smell of rotten eggs (sulphur dioxide) or be blue-black in colour. Get suspect trees, or those close to busy roads or near buildings, inspected. Trees damaged by flooding may die suddenly or show signs of decline this year or over the next few years. Unstable trees need to be felled. Safety is the primary management factor but where trees do not pose an immediate risk they may be retained until the situation is clearer. Apparently dead trees are best given space and time to see if they can recover. If a tree isn’t in the way or posing a safety risk leave it for a year to see if springs to life next year. Any struggling tree that is causing problems may need pruning of dead branches or even complete removal. Keep pruning of live branches to a minimum as this will only increase stress for the trees. Consider applying organic matter to help rebuild soil structure, but don’t do this until the water has drained away and the soil has had time to warm up. Flooded trees may have an increased vulnerability to drought due to the loss of roots so they may need irrigation in summer. In some cases soil analysis may be useful in identifying nutrient deficiencies that can be remedied. Be careful when clearing up debris. Although any toxins swept up in the floods are likely to be much diluted be aware of such chemical hazards. Also watch out for biting insects. After flooding the micro-topography of the site may have changed so watch out for new holes in the ground and possible trip hazards. Lastly, don’t plant intolerant species where further floods are expected within a reasonable timespan. Use the list of tolerant species above to help choose the right tree to plant.